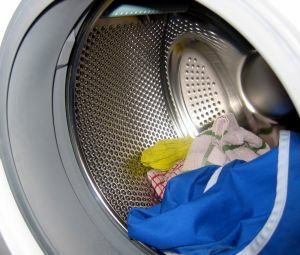 Cleaning your washing machine may seem like an oxymoron but it’s an important part of maintaining your appliance. Along with cleaning your machine, there are a few simple steps to prevent damage or smells. Monthly cleaning cycle– Running the cleaning cycle once a month will prevent odors from developing. Newer washing machine models have a cleaning cycle. If yours does not, simply run a normal cycle with hot water and bleach. Clean inlet hoses- The purpose of inlet hoses are to catch debris and minerals from entering the washing machine and are often overlooked. Cleaning them will make sure your water flows adequately to your washer. Remove load immediately- To prevent smells from forming, remove wet clothing as soon as possible. Keep door open- Another way to keep odors from forming, keep the washer door open slightly. This will allow air to circulate and dry up any moisture from forming. If you noticed that your washer isn’t working properly or you’re in need of replacement parts then Let’s Talk Parts. Authorized dealers of Fisher & Paykel parts, you know that your replacement parts will make your washer work like new. For more information contact Let’s Talk Parts at (336)464-0093. This entry was posted in Blogs and tagged contact, Let’s Talk Parts, replacement parts. Bookmark the permalink.